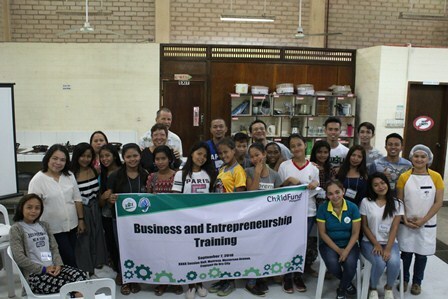 XSF-KKKK conducts entrepreneurship training for youth - Xavier Science Foundation, Inc. The Xavier Science Foundation – KKKK Project conducted a business and entrepreneurship training last September 7, 2018 at ATC session hall, Manresa Complex. The activity focuses on giving set of ideas on how to start a business in a simple way which enables the youth to become skilled, empowered and business-oriented entrepreneur. Moreover, with its annual celebration of Manresa Days, the training also provided a food processing demonstration in collaboration with Food Technology Center staffs of Xavier University as part of their annual activities here in Manresa farm which they able to adapt the step-by-step process in food processing; learn how to budget; and explore other business ideas and opportunities where they can possibly accessed. “The training is very helpful because the procedure is easy to catch up and we’ve been taught also about how to start a capital and how to be an effective entrepreneur”, said by Bryan Antero, a youth leader from Brgy. Indahag, Cagayan de Oro. The training is one of the core program of Alternative Life Long Skills (ALLS) which goal is to increase the involvement of youth in community activities and youth-led child protection advocacies.